233rd day of the year. There were then 132 days left in 2018. 62nd day of Summer. There were 32 days left till Fall. August 21, 2018 was the 3rd day of Hajj (Muslim Obsrvance). 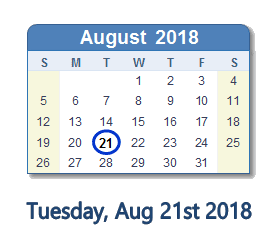 What happened on August 21st 2018? In other huge news, Republican congressman Duncan Hunter and his wife have been indicted by DOJ for allegedly using $250,000 in campaign money for their own personal expenses, including trips to Italy and Hawaii, and dental work.